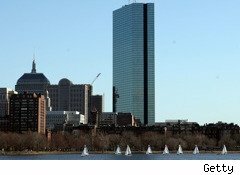 John Hancock is a big player in the 401(k) market. According to its website, the Boston-based financial services giant is the No. 1 full-service provider to 401(k) plans. It serves over 42,000 plans with more than 1.7 million participants. Whether these participants will retire in dignity or in poverty depends largely on the quality of the investment options offered by John Hancock.%%DynaPub-Enhancement class="enhancement contentType-HTML Content fragmentId-1 payloadId-61603 alignment-right size-small"%% I am sure most participants believe John Hancock is a "fiduciary," meaning that it ensures the investment options available to plan participants are the best ones that can be selected -- and that John Hancock puts the interest of the plan participants above all others. John Hancock does its best to encourage this belief. It represents that it is the "industry-leading fiduciary responsibility support." In October 2005, it announced the launch of a "fiduciary standards warranty for 401(k) plans." The warranty certainly sounded impressive. It provided "...401(k) plan sponsors and participants with specific assurances that its investment selection and monitoring process satisfies fiduciary standards established under the Employee Retirement Income Security Act (ERISA). The company promises to restore plan losses and pay litigation costs related to the suitability of this process or the investment options themselves. The warranty is being offered at no extra cost to plan sponsors." Flash forward to 2008. John Charters, a trustee of a law firm's 401(k) plan, alleged that John Hancock charged excessive fees and retained "revenue-sharing" payments from mutual funds included in the plan. As I explained in a previous blog, these payments are essentially kickbacks by the fund families to advisers to 401(k) plans as the price of entry into the plan's investment options. If they don't pay, they don't get to play. Prior to settling this case on undisclosed terms, John Hancock attempted to defend its conduct. How? According to a decision on its unsuccessful Motion to Dismiss the complaint, "Hancock argues that it is not an ERISA fiduciary because it does not exercise discretionary authority or control over the disposition of Plan assets." What?! The leader in "fiduciary responsibility support" claims it is not a fiduciary. How can this be? Welcome to the cleverly nuanced world of 401(k) plans where it is common practice for brokers, most mutual fund companies and insurance companies to talk the fiduciary talk, but not walk the fiduciary walk. Employers who believe they are getting a real fiduciary are often sadly mistaken. The big players who advise these plans -- brokers and insurance companies -- want no part of real liability for the quality of the investment options selected for inclusion in the plan. They understand the serious money is in accepting "revenue-sharing" payments from big mutual fund families. There is one way employers can protect themselves from these slick practices: Call the adviser to your 401(k) plan. Ask for written confirmation they are "ERISA section 3(38) fiduciaries." In all likelihood, they will not give you this assurance because a realERISA fiduciary cannot accept revenue-sharing payments. If this is the case, you need to find an advisor who will make this commitment. I contacted John Hancock and asked them to reconcile the position it takes when it is soliciting business with the very different legal position it asserted in the Charters case. I received no response.